Маркирани оферти за Kingston HyperX Cloud MIX HX-HSCAM Как са подбрани? 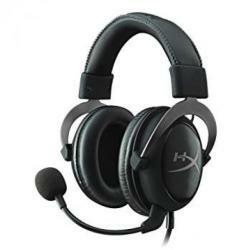 HyperX Cloud MIX is a versatile wired gaming headset that converts to a lightweight portable Bluetooth®1 headset. While using the wired connection, it is capable of pumping out rich Hi-Res Audio2 at frequencies from 10Hz to 40kHz, so you can hear details and nuances in your audio you might have missed. When the real world beckons, answer the call and unplug to switch to the wireless Bluetooth® mode for up to 20 hours3 of use. The HyperX custom-designed 40mm Dual Chamber Drivers separate the bass from the mids and highs to cut distortion and provide smoother audio. Featuring a tough aluminum frame, Cloud MIX is designed to withstand the perils of both gaming and life on the go. Whether you’re playing long into the night or out until early morning, the soft memory foam ear cushions give you signature HyperX comfort. The headset includes a flexible, detachable boom mic and features a built-in mic to make it a more travel-ready Bluetooth® headset. Cloud MIX features in-line audio controls for PC and console, with intuitive onboard controls for wireless mode. It’s compatible in wired mode with platforms with 3.5mm ports and compatible in wireless mode with Bluetooth® ready media.